Offices are a relic of the pre-Internet era. These days remote teams are the way to collaborate for results, while still having a life. I’ve been managing a remote team and business from my laptop for 12 years now. 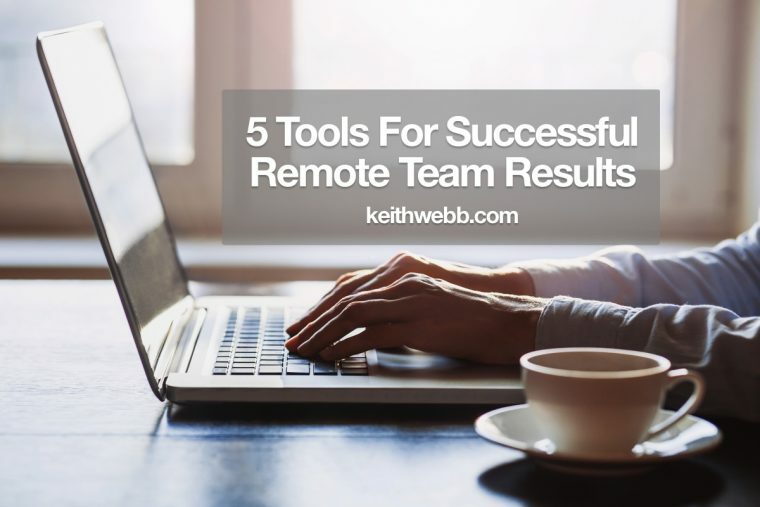 Here are my top 5 tools for successful remote team results. Working remotely is my preferred way of working. I work from home and wherever I find myself when I’m traveling. Today, I’m writing this article from a Starbucks. My business is far from a one-person show. Here’s what my remote team looks like. I live near Seattle. There are two Administrators working with us part-time, one lives near Seattle and the other near Denver. We contract with two marketing guys, one in New Jersey and one near Chicago. Our trainers live in Atlanta, Barcelona, China, Denver, Germany, Los Angeles, Morocco, Sacramento, Seattle, and Spain. When I tell people about our team, their first reaction is that team life must be chaotic and disconnected. The opposite is true. We are a highly productive, connected, and happy team. Forget paying rent, utilities, and office equipment. Office rent is an expensive and unnecessary operational cost with remote teams. Productivity is higher without the constant interruptions of an office. People get better results by focusing and doing deep work, rather than “collaboratively” chatting their way through the day. Hire the best qualified person, even if they live in another region. I’m able to hire the people I want to work with because they don’t need to live near me. Employees prefer the lifestyle benefits of working remotely. Flexibility is the new currency of employment. People want meaningful work that contributes to their lives. That means having the flexibility to watch their kids’ sports games, avoiding a mind-numbing commute, and not dressing up for the office. Why work remotely? In a word: Freedom. Freedom from being tied to an office. Freedom from having your life dictated by a 9 to 5 clock. Freedom to work with the best people in the world. Why work remotely? Freedom! Freedom where you work, when you work, and how you work. Working remotely has become a preferred way of working largely due to the amazing Internet tools available. Surprisingly, many of these tools are free. Here are my top 5 tools for successfully managing a remote team. Team communications. Slack is our dedicated communication hub. Message individuals or groups, share files and links, all in one place. Want to find an old message? No more hunting through emails, just scroll through their Slack feed. With apps for your computer and phone, it’s easy to stay in touch. And it’s free. Team email. Our website and email is the primary way we interact with our customers. My email inbox used to be out of control – forwarded emails, long threads, and 2 of us replying to the same customer. Now we use Groove, an email help desk, to bring all email into a shared browser that our Admin team can all see remotely. Emails come in from customers, are assigned, commented on, and answered. Customers receive a regular-looking email, no impersonal ticket numbers and “write above this line” responses. Groove costs per user and is worth it for increased customer service and decreased stress for you. Team projects. For project planning and team productivity there’s a lot of options. Programs allow a team to create tasks, make assignments, comments, add files, and keep track of details. I use Nozbe for my personal task management. For the team, we found BaseCamp to be more than we need, and at a fee. Asana and Trello are free, so we tried both. I preferred Asana, but my team preferred the visual task “cards” in Trello, so that’s what we use. In the end, the best software is the one you’ll use. Team finances. Our accounting is now fully digital. Quickbooks Online is the hub. We’ve connected bank accounts, credit cards, PayPal, and our store to automatically upload transactions. New cash expenses can be entered through an app with receipts attached by taking photos. We give different levels of access to our Administrator, bookkeeper, and CPA. There’s a log that tracks who did what, and it still doesn’t give people access to spend or withdraw money. Team Documents. Google makes is simple and free to go digital with your documents, spreadsheets, and forms. All our internal documents and reports are created and stored in Google Drive where team members can access them and make additions. (You can always click on “revision history” to go back, should something be changed that shouldn’t have.) We use Dropbox for storing our library of manuals, PDFs, images, logos, and other “static” files. Google Drive can store all these files too, but we haven’t made the switch yet. Working remotely has become a preferred way of working here are 5 tools for managing a remote team. The low cost of these 5 remote team management tools mean that you can begin improving your productivity right away. These tools will help you even if you work from an office. Start using them and see what opportunities present themselves. Question: What’s your favorite remote team tool? You can leave a comment by clicking here.